As winter continues to grip the northern hemisphere, fashionistas are holing up in galleries, studios and warehouses to celebrate the unveiling of designers’ Autumn/Winter 2018 collections at Fashion Week. If you live in London or New York, you’ve probably noticed the telltale signs – influencers posing outside venues, crowds of photographers waiting for a glimpse of the front row glitterati as they exit shows – and the carnival is set to roll on to Milan and Paris in the coming weeks. Equal parts business and entertainment, Fashion Week began in New York in 1943 as local designers sought to spotlight American fashion while Paris, the global centre of the industry, suffered the effects of World War II. Since then, the tradition has flourished in the four major fashion capitals, joined by smaller events in cities like Tokyo and Berlin. Seven decades on, however, times are changing. The acceleration of the fashion cycle and innovations in technology have led to accusations that Fashion Week is increasingly anachronistic, with Paper Magazine asking: “is 2018 the last year of in-person New York Fashion Week?”. The rise of social media streaming means that fashion brands can skip the costs of an expensive event and reach a broader audience online, a strategy that young, money-conscious brands have used to their advantage. Designers like Rebecca Taylor are also shaking up the physical catwalk format by harnessing VR tech including Google’s Tilt Brush app to showcase their clothing at smaller presentations outside the main Fashion Week schedule. While innovation is happening among the big fashion houses, Fashion Week continues to be the main forum for announcing new collections. And with over 560K conversations around the London and New York A/W shows on Instagram and Twitter alone, the spectacle remains as alluring as it did in 1943. We examined some of the trends and talking points from the first two events of the season. Celebrity endorsements and entertainment activations were responsible for some of the most discussed shows in New York this season. Accessories brand Coach won 11% of the share of brand-focused social conversation thanks to its partnership with Selena Gomez, who drove a huge 78% of mentions. Gomez sat front row at the Coach A/W show, providing significant exposure for the brand by wearing its products in what was her first public appearance of 2018. Gomez’s appointment as a Coach brand ambassador is part of an ongoing effort by the 77-year-old company to target a younger consumer demographic. Having previously worked with Gwyneth Paltrow in 2011, Coach pivoted towards much younger ambassadors in Karlie Kloss and Chloe Grace Moretz, then just 17, before partnering with Gomez in 2016. The brand is doing something right: according to Hitwise data, Coach’s website ranks third among top luxury fashion brands for visits from 18-34 year olds. On the entertainment side, Marvel Studios created one of the most unique shows this season in its ‘Welcome to Wakanda’ presentation. The event, which showcased Afro-futurist fashion inspired by the film Black Panther, was the fourth most talked about show at NYFW. 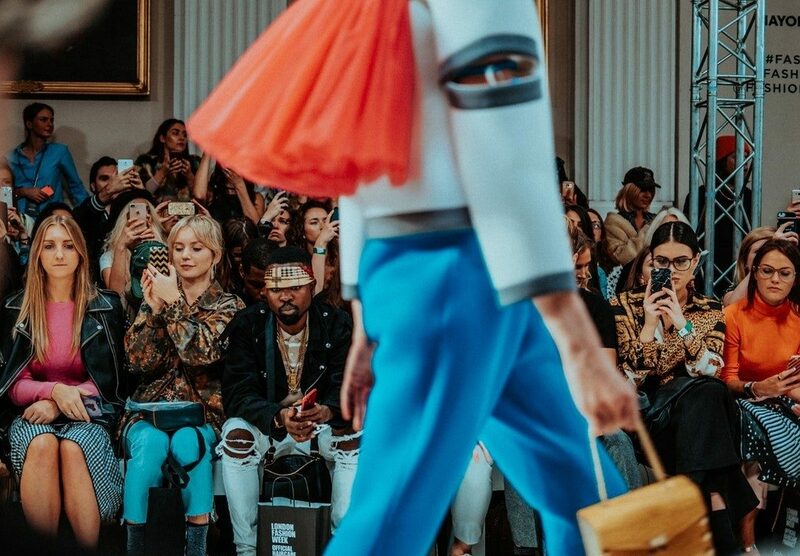 Fashion Week attracts a huge audience in both London and New York, but not all of those engaging with the event are dedicated followers of fashion. After excluding media and owned brand content, we found that fashion audiences (i.e. individuals with a specific interest in fashion) discussed Burberry and Tom Ford significantly more than any other show. As Christopher Bailey’s swansong, the Burberry A/W 18 show was an important one for the industry, featuring in almost 10% of all London Fashion Week conversation. Furthermore, 18% of the fashion audience discussing Burberry referenced Bailey’s departure, underlining the positive sentiment around the designer as he bows out. 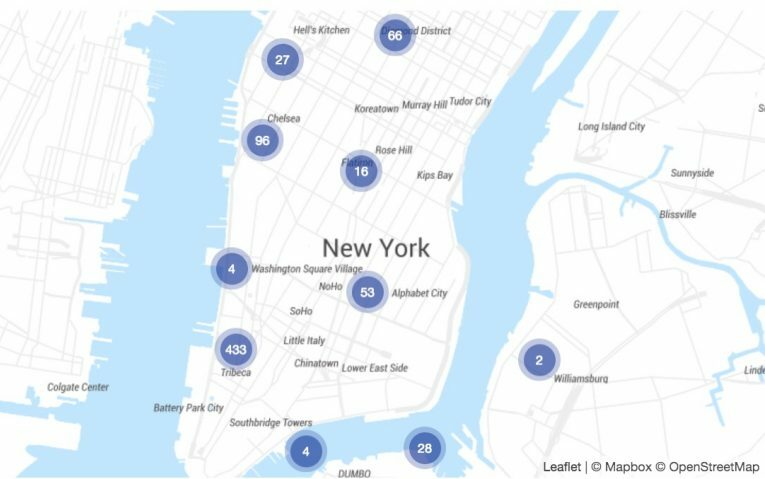 Based on a sample of geolocated Twitter data identifying the locations of fashionistas in New York, nearly a quarter of tweets came from the Tribeca neighbourhood. The location of Spring Studios, where many of the major shows are held, it was joined by Pier 49 (3%) and Industria in Greenwich Village (3%) as key venues. In London, Covent Garden and The Strand were the sites of almost a third of tweets from fashion audiences. Fashion hasn’t escaped the impact of the #MeToo movement. 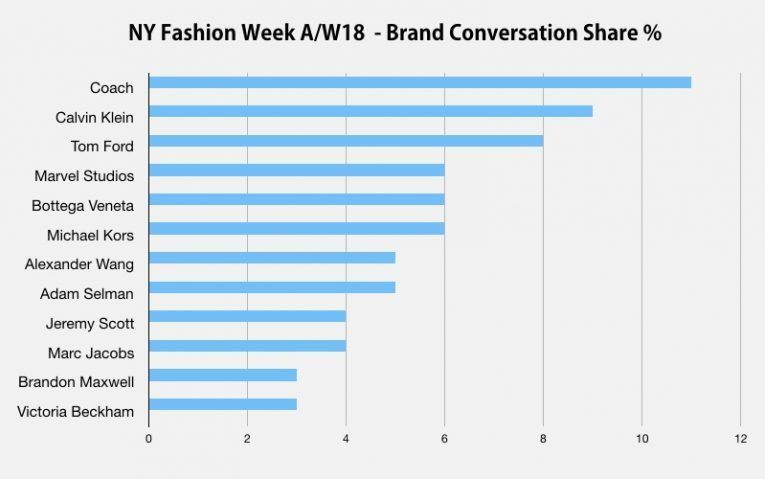 However, its influence was less keenly felt at Fashion Week than the diversity conversation: there was 38% more social conversation on Twitter and Instagram about the need for greater representation of different races, body types and sexual identities than #MeToo. Prabal Gurung’s NYFW show was the exception to this, accounting for 11% of all #MeToo and #TimesUp mentions with a collection referencing women activists in northern India. Meanwhile, Christian Siriano carried the torch for diversity at NYFW, driving 39% of all mentions following an inclusive show that featured plus size models. 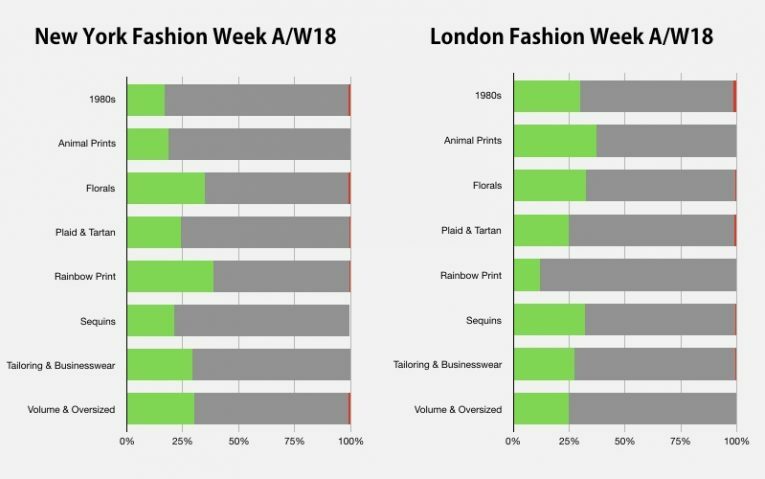 London Fashion Week was less politicised than its sister event across the Atlantic, producing fewer than ten mentions of #MeToo. Burberry was the only brand to embrace any kind of political message, with Christopher Bailey stamping his final collection in rainbow print – and rainbow check, subverting Burberry’s heritage colours – as a tribute to LGBTQ youth around the world. Finally, if you wondered what you’ll be wearing this autumn, the answer is an unlikely juxtaposition of floral prints and 80s inspired tailoring. Designers in New York leaned more towards formalwear than their London counterparts. Tailoring appeared prominently in collections from Cushnie et Ochs (5% of all NYFW trend mentions) and Victoria Beckham (4%). Perhaps most controversially, however, Tom Ford and Marc Jacobs heralded the return of 1980s-inspired fashion (55% of all NYFW trend mentions), attracting criticism from journalists who didn’t think it made sense to celebrate bold maximalist clothing in a Trump-era world. A lighter mood prevailed in London, where floral prints reigned with nearly a third of mentions being positive in tone after well-received shows by Delpozo (9% of LFW floral mentions) and Richard Quinn, whose vintage inspired designs even managed to attract the Queen to his front row. All in all, this season suggests that fashion is finally moving towards a place of greater diversity, with several high-profile brands referencing this in their collections. It will be interesting to see if this momentum can be sustained ahead of the Spring/Summer collections in September.